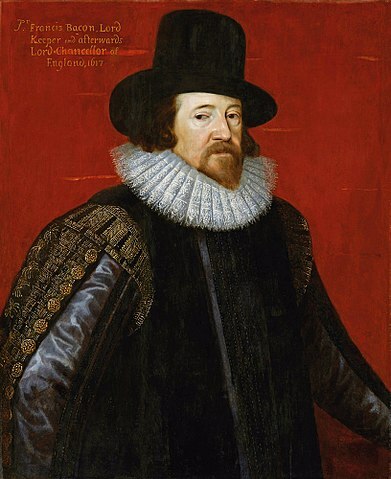 English philosopher, lawyer, statesman and scientist, sometime Lord Chancellor of England, and developer of the inductive method of reasoning. Bacon began his studies at Trinity College, Cambridge when he was 12 years old. He was first elected to Parliament in 1584 e.v. He was an adviser to both Queen Elizabeth I and King James I. He was knighted by King James in 1603 e.v. and became Lord Chancellor and Baron Verulam in 1618 e.v. He was also made Viscount St. Albans in 1621 e.v. Shortly thereafter, he was found guilty of accepting bribes and was forced to resign his offices. He subsequently dedicated himself to scientific pursuits and writing. He is considered one of the founders of modern science and the scientific method. His works include The Advancement of Learning (1605), The Wisdom of the Ancients (1609), Novum Organum (1620), and New Atlantis (posth. 1627). A minority of scholars consider him the true author of the works of Wm. Shakespeare.